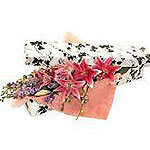 Product description: Fine box with beautiful fresh flowers. It 's really a very particular way to send your love! This sophisticated combination of roses, gerbera, tulips and seasonal greenery wrapped in an elegant green tissue will brighten your day. 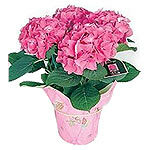 Send this beautiful flower bouquet to family and friends and make them feel like happyl! 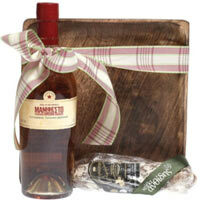 A perfect gift for any occasion, this Alluring Wine Party Picnic Gift Basket spreads happiness and brightness in the lives of the people you love. 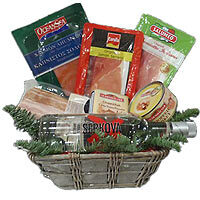 This ravishing Hamper carries One Bottle of Tsipouro Apostolaki aged Manifesto (700 ml.) and the 1st Stremmenou Salami Air Evrytanias 205-270 gr. 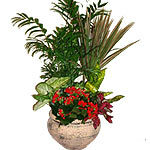 An assortement of blooming & green plants in a basket will perk up their day. This basket is composed of 3 different green plants.